Americans have prided themselves on being a nation of immigrants who helped to build the country and enriched its society and culture. Yet there has been an ongoing tension between welcoming newcomers and being concerned that the character of the nation might be changed. From the earliest years of the Republic, laws, representing various points of view, have been passed and guidelines have been developed to instruct prospective citizens on American history, values, rights, and responsibilities. Though a key requirement of citizenship is learning English, many guides are still available in the native languages of new immigrants. The Foreign Language Information Service provided translations in thirteen European languages. 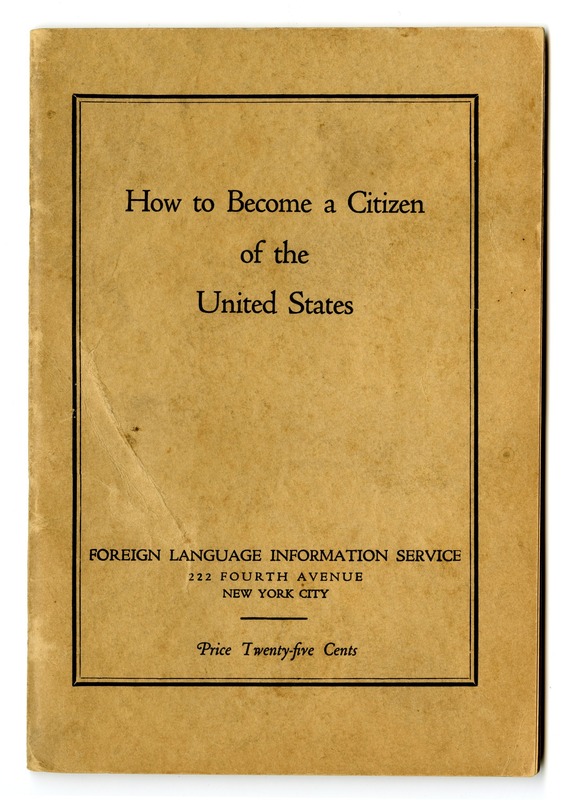 This guide includes President Franklin D. Roosevelt’s January 1941 “Four Freedoms” message to Congress, along with the Declaration of Independence, the Constitution, and the Bill of Rights, the historic founding documents new immigrants are required to study. A section of “Statements by Foreign-Born Americans” was added and included such notables as Albert Einstein. 1776: Declaration of Independence protests England’s limiting naturalization of foreigners in the colonies. 1789: U.S. Constitution, under Article I, Congress is “to establish an uniform Rule of Naturalization,” eventually giving the federal government the sole authority over immigration. 1789: Bill of Rights outlines basic rights under the new government. 1848: Treaty of Guadalupe Hidalgo extends citizenship to all inhabitants living in the territory annexed to the United States following the Mexican War. 1865: Thirteenth Amendment abolishes slavery, although it did not grant formerly enslaved persons the full rights of citizenship. 1870: Naturalization Act of 1870 extends naturalization rights to former African slaves not born in the United States; Asian immigrants remain excluded from citizenship. 1882: Chinese Exclusion Act of 1882 is the first U.S. law to ban immigration based on race or nationality; it would be repealed in 1943. 1898: U.S. Supreme Court rules in United States v. Wong Kim Ark that any child born in the United States, regardless of race or parents’ citizenship status, is an American citizen. 1917: Jones-Shafroth Act grants U.S. citizenship to residents of Puerto Rico. 1921: First quota law is passed limiting the annual number of immigrants based on country of origin. 1924: Indian Citizenship Act extends U.S. citizenship to all Native Americans. 1940: Alien Registration Act requires all non-citizen adults to register with the government and empowers the president to deport foreigners suspected of espionage or being a security risk. 1952: Immigration and Nationality Act eliminates race as a bar to immigration or citizenship. 1965: Hart-Celler Act abolishes the national origins quota system, replacing it with a preference system that focuses on immigrants' skills and family relationships with citizens or U.S. residents. 1986: Immigration Reform and Control Act of 1986 grants amnesty to millions of individuals living in the United States who entered the country before January 1, 1982. 2001: USA Patriot Act amends the Immigration and Nationality Act to broaden the scope of aliens ineligible for admission or deportation to include terrorist activities.